I can't believe we got an xmas tree! ok, so this is just crazy. apparently the dumpster gods have taken pity on us for the Great Ear Debacle of yesterday. today we went out to do errands and as we were driving past the dumpster, we noticed the top of a pine tree peeking out. we hopped out of the van and Jovino retrieved a 7 foot tall real tree - with a base! there were even a couple of ornament hooks still attached. DOOD. it's not even xmas for a week! it took some setting up - we're guessing that the reason it was tossed was that it kept falling over and rather than drop more money on a better stand, they gave up. Jovino came up with the ingenious idea of using ratchet straps to secure it to the bar. we had some concerns about the cats wanting to climb it, but so far they seem fairly indifferent. we've been joking that this is the inevitable result of the trend to start the xmas marketing earlier and earlier every year (so whoever it was was done with it sooner) but I bet they just got tired of sweeping up broken ornaments. I'm really curious which of our neighbors tossed it, but will probably never find out. it's someone from the building though because the dumpster is in our gated parking lot. 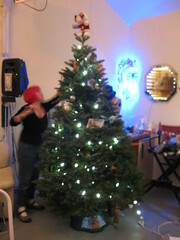 I haven't had a real tree in years - I actually finally gave away the *really nice* tree stand I bought BITD last summer. :-/ kinda unforch as the crappy stand it came with really does nothing except provide a water basin, but I honestly thought I would never have another cut tree in the house. I know they are farmed but I have to say that cutting down an entire *tree* as a temporary home decoration just doesn't seem right to me. but, who am I to refuse the boons of the dumpster gods? I have to admit,the house smells fabulous. we'll haul it over to Ocean Beach and burn it when the time comes, to give it a proper sendoff. As for cutting down trees, do keep in mind that younger trees produce a higher net amount of oxygen than mature trees do... We have our tree composted by the city when we are done rather than burn it, altho there is a Christmas tree burn here at the beach in January. Anyhow, I hope you guys can turn things around more. I think this xmas tree has spirit. I saw a fresh x-mas tree dumped on the sidewalked in front of the National Holistic Institute in Emeryville this morning. A new trend? Who knew?